Suri Cruise spotted playing at a park in LA on February 19th 2016. 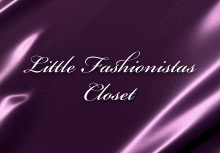 Suri was wearing Floral Turquoise Dress from Flower Garden SS13(!!!) line by Crazy8 and Bailey Bow Boots in Chestnut by UGG. 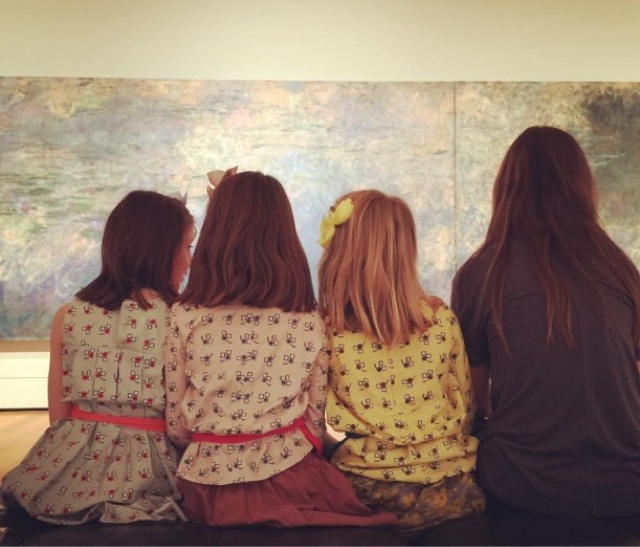 Suri Cruise pictured with friends while enjoying art at the MOMA in LA on February 8th 2016. 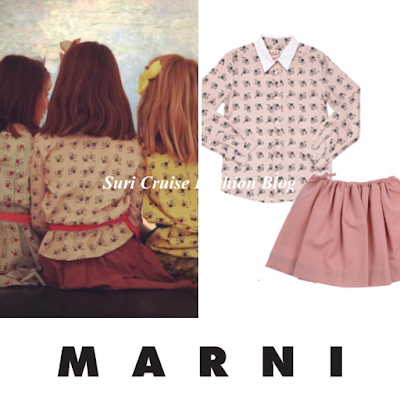 Suri is in the middle wearing Pink Peter Pan Collar Shirt by Marni AW12 and Dusty Pink Skirt AW16 also by Marni. Suri Cruise & Katie went out for dinner with a friend in LA on January 21st 2016. Suri was wearing Violet Suede Utility Jacket SS'12 by Holmes & Yang (first seen on March 19th 2012). 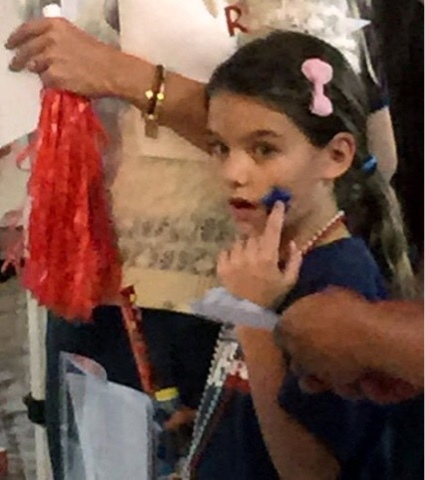 Suri Cruise spotted while out shopping in LA, sometime in January 2016. 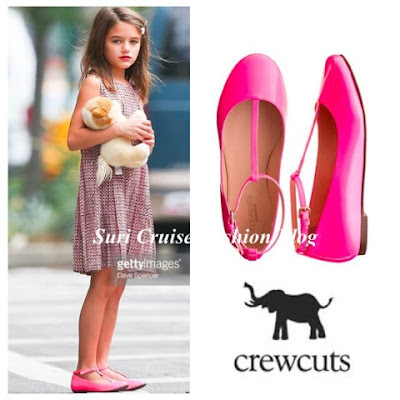 Suri was wearing Nepal Pattern Boots by Toms (first seen on October 26th 2015). 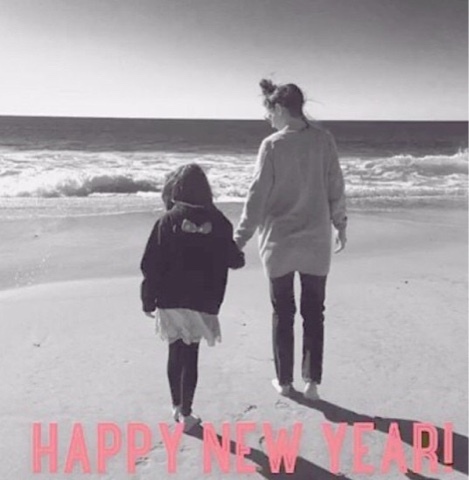 Suri & Katie wished everyone Happy New Year with a beach snap! Suri was wearing Minnie Mouse Hoodie by Disney. 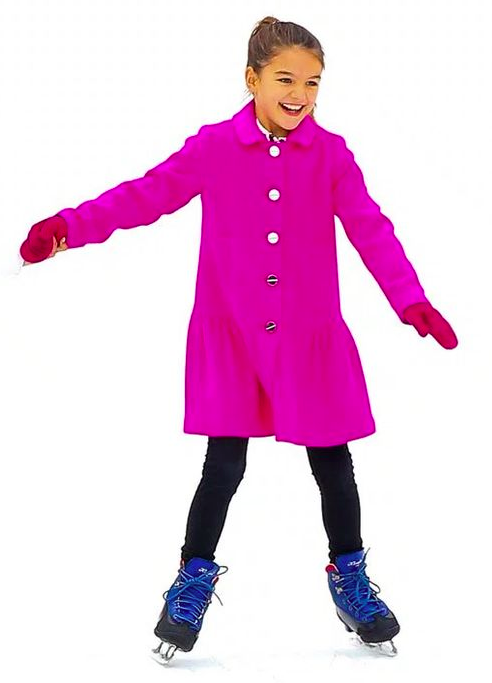 Suri Cruise spotted out in NYC with nanny on December 19th 2015. 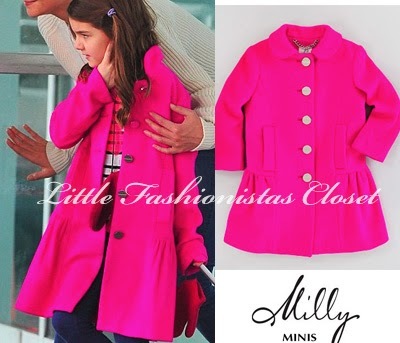 Suri was wearing Zoey Pink Peplum Coat FW13 by Milly Minis (first seen on March 23rd 2014) and TStrap Shoes SS14 in Pink by Crewcuts (first seen on July 27th 2015). 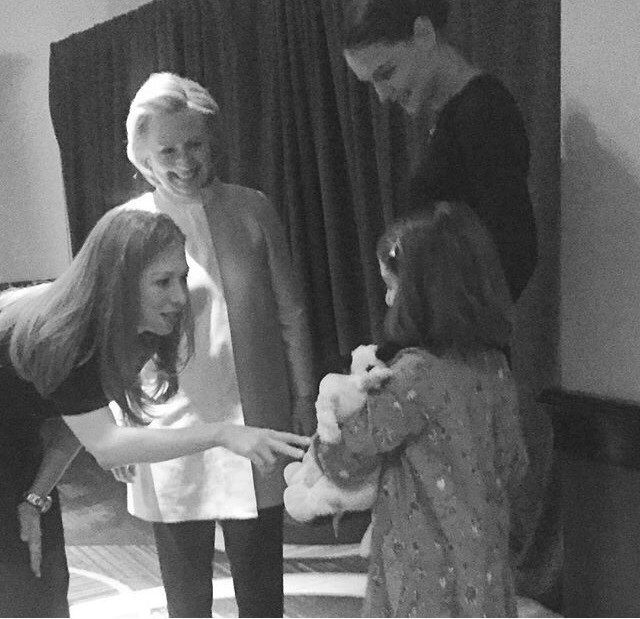 Suri Cruise got to meet Hillary & Chelsea Clinton at a private fundraiser in NYC on December 17th 2015. Suri was wearing a dress by Bonpoint. Suri Cruise & Katie departed from JFK traveling to Ohio, to celebrate Thanksgiving with family, November 2015. Suri Cruise spotted on her way to gymnastics class in LA on November 16th 2015. Suri was wearing Pinstripe Denim Shorts by Chloe. Suri Cruise was spotted leaving Sky High Center in LA on November 15th 2015. Suri was wearing Stripe Hoodie with Heart (no ID, first seen on March 23rd 2014) and High Top Pink Converse. 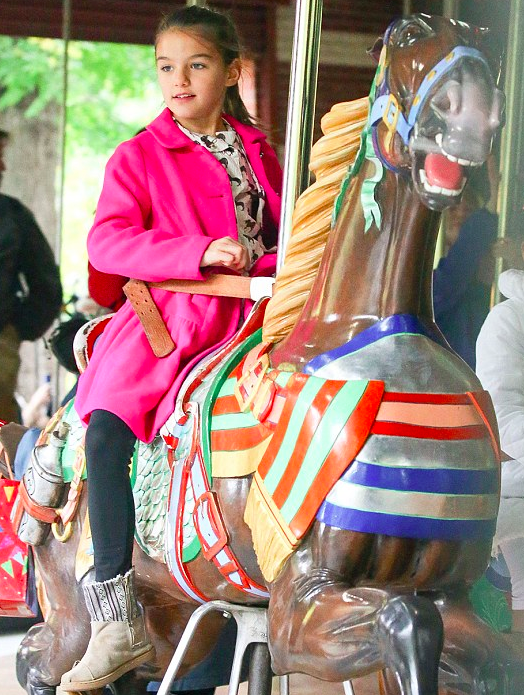 Suri Cruise was spotted with a friend out & about in NYC on October 26th 2015. Suri had a fun day filled with sweet treats, ice skating and riding a carousel! 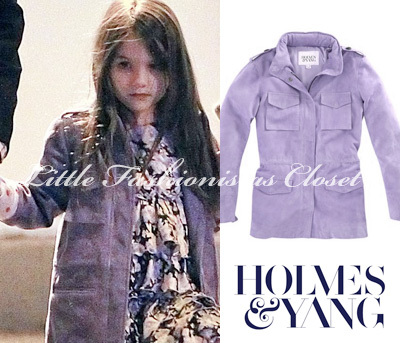 Suri was wearing Silk Print Horse Dress FW14 by Pale Cloud, Nepal Pattern Boots by Toms, and Zoey Pink Peplum Coat FW13 by Milly Minis (first seen on March 23rd 2014). 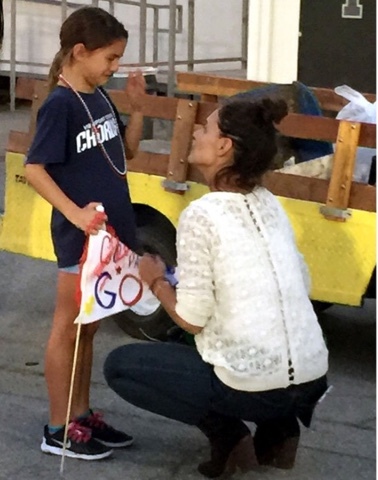 Suri Cruise was seen cheerleading for her school's team in LA, sometime in October 2015. Suri was wearing Free 5.0 Sneakers in Black by Nike.